24 cards and 24 envelopes.
" 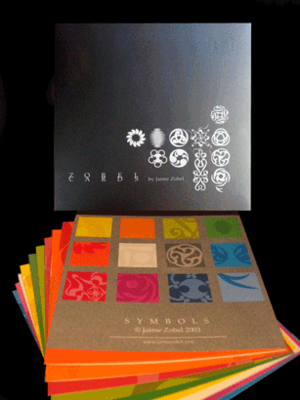 Symbols: the synthesis of body and spirit; the power of the mind to shape its own abstractions from what the senses and the soul can apprehend. Symbols work in the realm of ideas; they are distillates of the intellect, the visual representations of the essence of what began as powerful emotions, sensations, intuitions. In SYMBOLS, Jaime Zobel's hand and his mind rather than his eye and his camera are most operative. Zobel drew inspiration from the East and West, from Japanese and Celtic sources. His SYMBOLS invite us to philosophical inquiries and because they are more dynamic than static, remind us that life is ever in flux, in a state of creative tension."